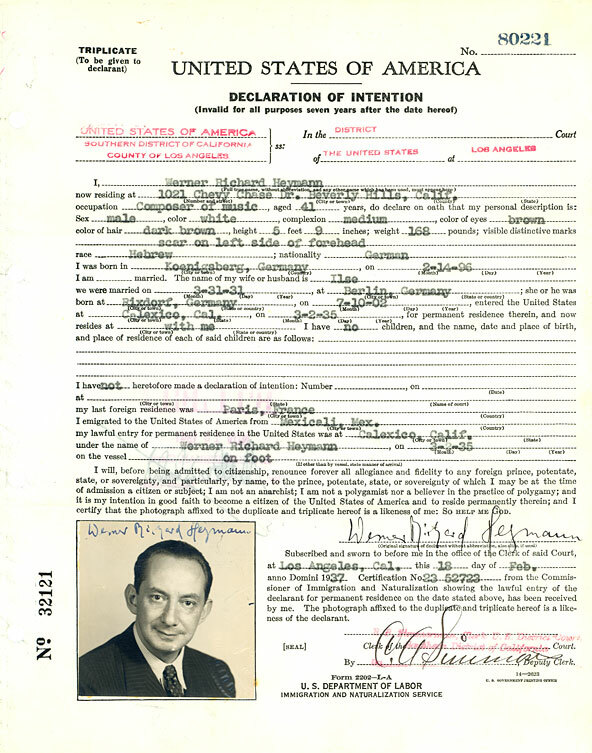 Photo from Heymann’s application for U.S. citizenship. 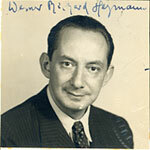 Werner Richard Heymann was the most famous film composer in Germany and France until 1933. Werner Richard Heymann, the composer of all these melodies, was born into a turbulent era when, in 1896, he came into the world as the son of a Jewish corn merchant in Königsberg. His father was a man of artistic talent and his mother enjoyed the reputation of being an excellent pianist. The parental legacy soon became apparent: their son Walther began writing expressionistic poems that were soon appearing in Herwarth Walden’s magazine “Der Sturm”, Walther’s younger brother, Werner Richard, exhibited a musical talent from very early on. At the tender age of three he had already started to sit at the piano and was soon playing everything he heard; at the age of five he was tinkling out his own melodies; and when he was just six years old, he received violin lessons, writing his own first compositions at the age of eight. At twelve he became a member of the philharmonic orchestra, plunging eagerly into the study of music theory and counterpoint and presenting his first work for orchestra at the age of 16. Contemporaries could find no other words to describe him than “child prodigy”. One day, you and I will meet? Two years later when his Rhapsodische Sinfonie für Bariton und Orchester – Rhapsodic Symphony for Baritone and Orchestra – was accepted by a renowned Viennese music publisher, he finally seemed to have achieved his breakthrough. This work was a tribute to his dead brother and had its premiere in November 1918, performed by the Vienna Philharmonic Orchestra conducted by Felix Weingartner. A short time later it was also performed in Berlin. Lovers of serious music noted the name of the young composer: Heymann. But the composer himself was already receiving a new impetus in Berlin, that restless and revolutionary city. His encounter with Johannes R. Becher turned him into a radical pacifist, he took sides, became interested in politics and got involved in the “Council of Intellectual Workers”. Among the Dadaists he met George Grosz and Walter Mehring. He was still working on the concept for his second symphony when he was asked whether he would like to write the stage music for Ernst Toller’s first work Wandlung – Transformation -, which was on the programme at the Berlin “Tribune”. The job appealed to him, especially since he recognised himself in the main character played by Fritz Kortner. The play is about a young Jew who hopes to finally find acceptance and a home through his enthusiastic dedication to the idea of the Great Patriotic War, but who is so shattered by his experiences at the front that he gives up the Fatherland, which has become a slave to the state, so that he can serve a humanitarian ideal as a revolutionary. When “Sound and Smoke” was no longer able to live up to the promise of the first programmes, Heymann and Hollaender had Mischa Spoliansky take over at the piano and looked for new jobs. Heymann composed the stage music for Georg Kaiser’s play Europa, which was performed at the Grosses Schauspielhaus with Heinrich George, Roma Bahn, Alexander Moissi and Werner Krauss. Then, a restless wanderer between several worlds of music, he travelled south to Capri, where he wrote a string quartet which Stefan Zweig had performed in his Salzburg château on the Kapuzinerberg in 1921. Back in Berlin, Heymann met Trude Hesterberg, the singer of his first chanson opus; she intended to use the experience she had meanwhile gathered with the cabaret to become a director of her own business and asked him whether he would like to join her. The musician did not need much persuasion, although he could not possibly know that the “Wilde Bühne” that Hesterberg intended to set up in the basement of the ‘Theater des Westens’ on Kantstrasse was to open up a new and important chapter in the history of cabaret. Kurt Tucholsky wrote his Prolog for the opening programme that was performed on the tiny basement stage in September 1921. Annemarie Hase sang Leo Heller’s street ballads, Isabel Herma recited Mehring’s Moralisches Glockengeläute – A moral peal of bells -, and Kurt Gerron went on his Nachtspaziergang 1921 – Night walk 1921 – through pulsating post-war Berlin. And then there was also “wild Trude” herself, who, according to critic Kurt Pinthus, “belts out her chansons as if from a well-oiled Browning”. Musical director Werner Richard Heymann, who supplied the compositions, was largely instrumental in turning the “Wilde Bühne” into what the press called “the Berlin cabaret with the highest artistic merit”, and one “that was well on its way to becoming a modern version of what the inventors of the genre had in mind for their time”. There was close co-operation with Klabund and especially with Walter Mehring: An den Kanälen – Down by the canals -, Arie der großen Hure Presse – Aria of the great whore press -, Die Kälte – The cold -, Die kleine Stadt – Little town -, Die große Sensation – The great sensation. But in those inflationary times, the “Wilde Bühne” soon got into financial difficulty, principally because of its uncompromising line, and its days were numbered. After the concert hall, the theatre stage and the cabaret, Heymann got involved with a new medium – film. Producer Erich Pommer introduced him to the Ufa (Universum-Film AG), where, with his own small orchestra, he supplied “mood music” while they were shooting silent movies in the Babelsberg studios. A short while later he became assistant to Ernö Rapée, the chief musical director of the Ufa who had an orchestra of 70 available at the Ufa Palace near the Zoo. In those days Heymann wrote, as he records in his biographical notes, “around 3000 pages of scores for large orchestras every year”. When Rapée returned to America in 1926 Heymann became his successor and took over as musical director of 120 cinemas. What happened next Heymann outlined as follows: “I leave the Ufa in protest against the Hugenberg regime – write my last stage music for Max Reinhardt: Artisten – write my first world hit: Kennst Du das Haus am Michigansee? – Do you know the house at Lake Michigan? – Join the Tobis – Work together with the inventors of the sound movie, Masolle, Vogt and Engel; make first German sound movies.” Till then he had written the music for more than a dozen silent movies, including the music for Murnau’s Faust film version, Asagaroff’s Jugendrausch – Youthful rapture -, Arnold Franck’s Der große Sprung – The great leap – and Fritz Lang’s Spione – Spies. Heymann once confessed that he had never intended to write hits. But when, to his surprise, his songs actually became hits, he started to enjoy writing them, although he realised that these successes would cost him his reputation as a ’serious composer’ and an entry in serious encyclopaedias of music. But never mind: Heymann wrote one sound-film hit song after another. And without exception they were all to become “Ervolkslieder” (a blend of the German words Erfolg and Volkslied, meaning “successful song” and “folk song”) as his lyricist and close friend Robert Gilbert liked to call them. Heymann’s collaboration with Gilbert started in 1930 for Wilhelm Thiele’s film comedy Die drei von der Tankstelle – The three from the garage – with Lilian Harvey/Willy Fritsch, who had become the dream couple of the silver screen, and Heinz Rühmann, Oskar Karlweis, Kurt Gerron, Fritz Kampers, Olga Tschechowa, Felix Bressart and the Comedian Harmonists. With their seemingly impromptu hits like Ein Freund, ein guter Freund – A friend, a good friend, mein Herz läßt dich grüßen – Darling, my heart sends its love, Erst kommt ein großes Fragezeichen – First there’s a big question mark – and Lieber, guter Herr Gerichtsvollzieher – My dear, my good Mr. Bailiff -, the Heymann/Gilbert team were exactly what the newly emerging sound films required. And the authors also broke completely new ground when, as already anticipated in Liebeswalzer, they attempted a genre that can be looked upon as the precursor of the film musicals still to come: the film operetta. In the cinemas from September 1930, the film, of which a French version was also made, broke all records – it was by far the most successful production of the season. Heymann’s music contributed a great deal to this, with its catchy tunes it caught the mood of the people in the last years of the Weimar Republic and it satisfied people’s longings for a tiny bit of security and a sense of optimism. No wonder the film was a big box-office success. The recipe for success worked in other productions as well. And Heymann always had the right hit song ready: Frag nicht wie, frag nicht wo – Don’t ask how, don’t ask where -, and Du hast mir heimlich die Liebe ins Haus gebracht – You sneaked love secretly into my home (in Ihre Hoheit befiehlt – By Royal Command), Eine Nacht in Monte Carlo – A night in Monte Carlo – Das ist die Liebe der Matrosen – That’s how sailors love you – and Wenn der Wind weht – When the wind blows (in Bomben auf Monte Carlo – Bombs on Monte Carlo), Es führt kein andrer Weg zur Seligkeit – There is no other way to happiness – and Hoppla, jetzt komm ich – Look out, here I come (in Der Sieger – The Winner), Gnädige Frau, komm und spiel mit mir – Milady, come and play with me – (in Quick), Wir zahlen keine Miete mehr – We aren’t paying rent any more -, Einmal schafft’s jeder – Everybody succeeds once – and Irgendwo auf der Welt gibt’s ein kleines bißchen Glück – Somewhere in the world there is a little bit of happiness – (in Ein blonder Traum – A blond dream), Wenn ich Sonntag’s in mein Kino geh – When I go to my cinema on Sundays (in Ich bei Tag und du bei Nacht – Me in the daytime and you at night) and Mir ist so, ich weiß nicht wie – I have a feeling, I don’t know what it is – (in Saison in Kairo – Season in Cairo). The seizure of power by the National Socialists started a massive exodus of artists: a whole generation of prominent and successful actors, directors and script writers were ejected from the Babelsberg UFA studios. Overnight, Heymann left his home country with two suitcases and 600 marks in his pocket and escaped from Berlin via the Saarland to Paris where he wrote his first operetta based on a book by Sacha Guitry: Florestan I., Prinz von Monaco – Florestan I., Prince of Monaco. The premiere was in 1934 in the “Bouffes Parisiens”. The main hit once again revealed the old Heymann quality: Margot. He then went to Hollywood to work for Centfox to write the music for Caravan. Here he met Charell again, who was filming the comedy with Loretta Young and Charles Boyer. But Charell was unable to establish himself in Hollywood, and the first encounter with the New World also proved to be a bitter disappointment for Heymann. The German emigrés were looked upon as difficult, and ill-adapted to new situations. Old successes in distant Europe did not count for very much here. Werner Richard Heymann had the reputation of being a stubborn German, especially as the English language was not exactly his thing. Werner Richard Heymann went back to Europe. This was the beginning of a restless time, which continued until 1936, when he made a second attempt to be successful in Hollywood. This time the conditions were more favorable than his first début: Ernst Lubitsch got him to work together with Friedrich Hollaender and had them write the music for the film Bluebeard’s Eighth Wife. Billy Wilder, a friend from the old days at the UFA, also worked on the script. The collaboration between Lubitsch and Heymann developed into a series. Year after year produced a film classic: 1939 Ninotschka, 1940 The Shop Around The Corner, 1941 That Uncertain Feeling, 1942 To Be Or Not To Be. Heymann worked for Alexander Hall, Lewis Milestone, Richard Wallace, Charles Vidor, Preston Sturges and Harry Joe Brown. He had the reputation of being a good, sound craftsman – the man in the background. He wrote the music for more than forty Hollywood films, most of them light comedies, from time to time with a mild dose of social satire, and now and then for a science fiction movie. His background music was nominated four times for the much-sought-after Oscar: in 1939 for One Million B.C., in 1941 for That Uncertain Feeling, 1942 for To Be Or Not To Be and in 1944 for Knickerbocker Holiday with Weill’s world-famous September-Song. Two years later, the team of authors tried to repeat the succés d’estime, clinched by at least 75 performances. This time it was with a remake of an old favourite project of Heymann’s, which decades previously had run under the title of Dame Nr. 1 rechts – Lady No. 1 on the right – with the then still young Käthe Dorsch: Kiki vom Montmartre – Kiki from Montmartre. This musical comedy also draws its strength from its nostalgic element of by-gone days. One of the main songs, Das schönste sind die Damen – The most beautiful things are the ladies – is written to a strict marching rhythm, just like the songs from the days when Heymann worked for Ufa. The text by Volker Kühn has been taken – in a much abridged form – from the catalogue for the exhibition “Ein Freund, ein guter Freund – Der Komponist Werner Richard Heymann” – A friend, a good friend – the composer Werner Richard Heymann (Akademie der Künste, Berlin 2000). After Berlin, Munich and Salzburg, the exhibition can be seen at the Ostpreussische Landesmuseum in Lüneburg from July 2001 to February 2002.